Delivery single payment of £29.00 for any number of items (Inc. VAT), or FREE if you spend over £400. (Please note, delivery prices (including free delivery) only applies to Mainland England and Wales. Delivery to Scotland and other parts of the UK may cost more (stoneware only). Please contact us for further information). 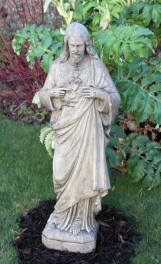 A smaller more manageable version of our popular Jesus statue. This truly is the most impressive stone statue of Jesus available to buy in the UK. A stunning centrepiece for the garden. The stone is durable and strong, withstanding all weather conditions. Please note our friendly driver is happy to position this item to your desired location. Excellent Customer Care - We take our customer service personally and seriously and reply to emails quickly. We value our customers and if you're not happy, then neither are we! Company Trust - We are an established, family business retailer and we are real people and not just a quick buck internet company. Quibble free returns - If you do not like what you ordered, that's no problem at all! Get in touch and we will deal with the rest. Low prices - We monitor our prices regularly. But if you do find the same product cheaper elsewhere, we will do our best to beat the price!